"I've fallen and I can't get up" may have been a popular pre-Internet meme in the '80s and '90s (back when you were oh-so young), but if you're over 65 today, then you probably know that the risk of taking a tumble is very real. In fact, according to the Centers for Disease Control and Prevention, falls are the most common cause of injuries in older adults, with more than one in four seniors falling every year. Of those falls, one in five is results in serious injuries like broken bones or head trauma. So what's to blame for the increase in falls? While certain medications, middle ear issues, and loss of vision can all affect balance, making you more likely to fall, experts say that loss of muscle mass is almost always an issue. "We need to have strong muscles in order to have good balance," notes certified trainer Carole Michaels, ACE, ACSM, founder of Recovery Fitness. 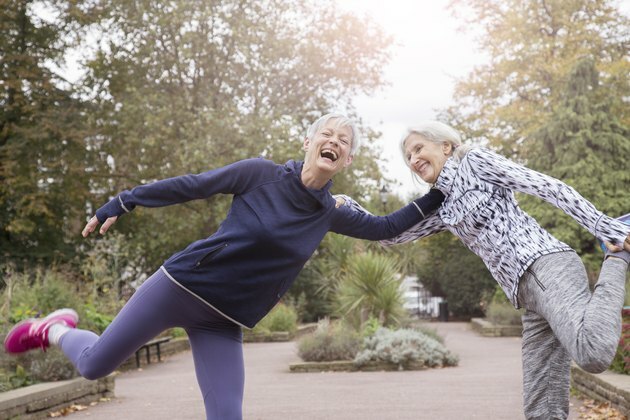 Fortunately, she says, "Balance and strength exercises can help prevent falls by improving your ability to control and maintain your body's position whether you are in motion or stationary." Read on for your complete balance-boosting routine. If you haven't been active lately, just be sure to get the official okay from your doctor first. Before any kind of workout, you'll want to briefly warm up. While keeping your back straight and either sitting or standing (depending on your strength and balancing skills), march your feet in place for three to five minutes to raise your core body temperature and ready your muscles and joints. Pump your arms or do large arm circles as you march if you can do so comfortably without feeling off-balance. Continue with a set of dynamic ankle circles to activate your core and loosen your ankle joints. Either sit or stand with your fingertips on the back of a chair for support; then raise your right foot slightly off the floor and slowly rotate it 10 times to the right. Reverse direction and rotate the foot another 10 times. Repeat with your left foot. As your balance improves, progress to standing without support. If you're feeling steady on your feet, move on to this quintessential balance exercise: Stand behind a sturdy chair for support and draw your right foot up toward your left knee. Hold the position for 10 seconds; lower your foot and switch to your left leg. Repeat for three to five times for each leg. Once you've mastered that, here are four ways to make the one-legged move more challenging: Increase the duration of each repetition; cross your arms over your chest; close your eyes; or balance on an uneven surface, such as a small cushion. Bump up the difficulty level even more by writing the alphabet in the air with your raised foot or tossing a ball back and forth with a friend without lowering the foot to the floor. To really put your balance to the test, move to one end of a long wall. Stand arm's-length from the wall (close enough that you can touch it for light support if needed), and turn so one shoulder is adjacent to the wall. Step forward on your left foot, touching your left heel directly to the toes of your right foot. Continue walking heel to toe (as if on a balance beam) until you've traveled the length of the wall. If that's too easy for you, you can take things up a notch by walking backwards, crossing your arms over your chest, closing your eyes, or turning your head from side-to-side as you step. To make things even harder, introduce a cognitive challenge, such as counting backward from 100 in increments of three while doing the heel-to-toe walk, suggests the American Council on Exercise. Another side effect of losing muscle mass as we age? Our muscles become less flexible, which also has a negative effect on balance. Tight muscles in your lower body — particular your calves — may lead to stumbling. "Tightness in the calf muscles can limit how well the ankle moves and will alter mechanics when walking, moving from sitting to stand and when climbing stairs or other inclines," says trainer and physical therapist Tom Biggart. To help improve flexibility, sit on a chair and extend your right leg in front of you. Loop a resistance band around the sole of your foot and gently pull back on the ends of the band to feel a stretch in your right calf muscle. Repeat up to four times on each side. If you feel unsteady, dizzy or short of breath at any point, stop your exercise, move carefully to a chair and sit down. If you suspect there might be an underlying medical reason for your balance issues, visit your doctor for a consultation.